Having returned to the United States, the way I function in relation to the rest of the world is completely different. I would consider myself a homebody who typically leaves the home to go to school or work but not to explore or be part of the community simply for the sake of being part of the community. I am happy to volunteer for specific events or dedicate time to activities that have set times, but I don’t generally go for walks in unexplored territory or further than a radius beyond a couple blocks of where I live. Dear Prague, you have inspired me to increase my footprint in the world. As an adult student registered with Students Services for Disabilities, I think having that mark really impacted my view of myself and what I am capable of doing. I know that I have overcome a lot but due to the amount of time I have spent in hospitals or convalescing I am comfortable being indoors. Now that I know that I can explore the world, I am empowered to continue to do so. Dear Prague, you have inspired me to empower myself. This week, for example, I spent time with one of my classmates from our study abroad program. We are both adjusting to life back in the States, and it was a beautiful connection to meet at home with a friend who lived a similar experience. It became clear to me that I can travel around the city at my will and that I am not limited to my little corner of the city of Chicago only going to campus to study or to a job site. Armed with a liter of water, my UPass, and supplies for the day I can spend a day out in the city of Chicago just as I did in Prague. Dear Prague, you have inspired me to live in a more worthwhile way. My friend and I shared with each other that it was a bit of culture shock to return to the States and encounter common behaviors of Americans. 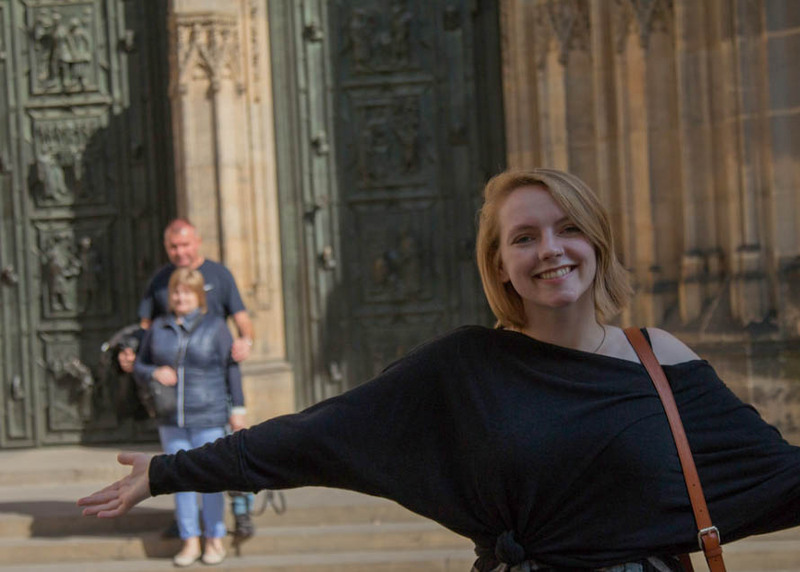 From O’Hare airport and back to our neighborhoods, we traded stories of how we missed walking down the streets of Prague because the people we encountered had a quieter, more respectful, perhaps, demeanor. 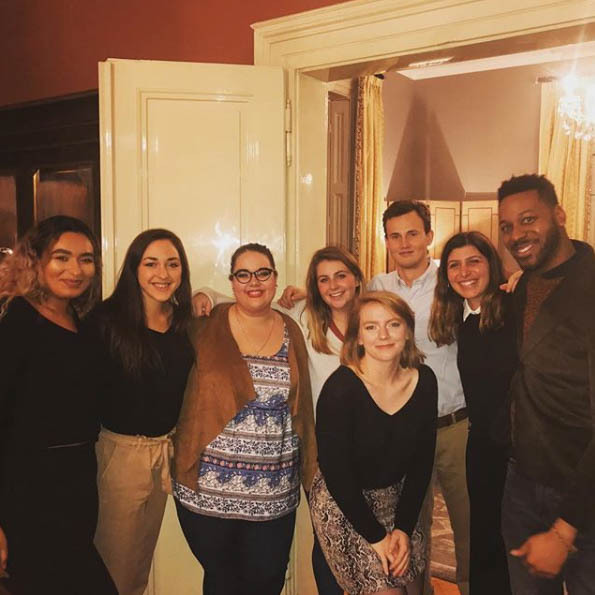 We laughed about how we can look at behaviors of Americans in the Lincoln Park or Lakeview neighborhoods and how those neighborhoods specifically cater to the idea of remedying hangovers. In Prague, however, Pilsner Urquell is a commonality but the expectation is that people enjoy their beers with friends and won’t require a “Hangover Smoothie” the next day. Dear Prague, you have inspired me to have a beer every once in a while. My new-found feelings of limitless exploration and self-empowerment are perfectly timed as I extend myself into the professional world looking for full-time work. I have decreased anxiety about a commute to get to a new location and don’t mind the idea of visiting friends in different neighborhoods. The confidence I have gained from traveling is something that I will carry with me for the rest of my life. And because of my travels, I am confident that now my life will be more interesting. Dear Prague, you have inspired me to test my limits and look for new challenges as I continue to write my story. My name is Lissette Hall, and I am very excited to be writing from Prague in the Czech Republic. Thanks to the Gilman Scholarship I have been able to fulfill my dream of studying abroad and travelling to Europe. 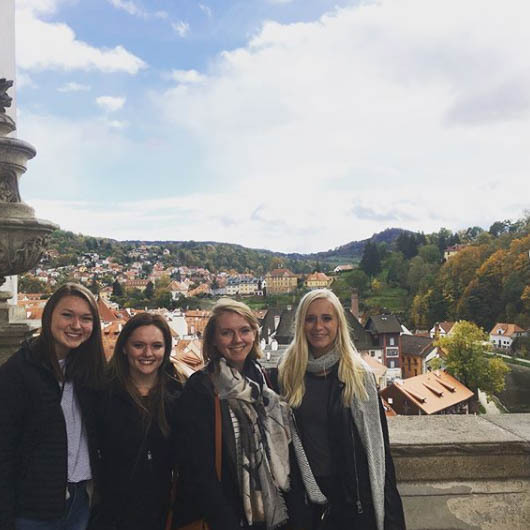 As a non-traditional student who has used accommodations throughout my college matriculation, I was not sure if my goal of studying abroad was within my grasp. Because of the support of Gilman and Columbia College Chicago, I am able to graduate with Honors and achieve my goal of international travel. I am proud to be a member of the graduating Class of 2015 with a Bachelor of Arts in Comedy Writing and Performance with a minor in Arts in Healthcare. During my senior year, I was lucky enough to work at The Second City Training Center serving as their Wellness Programs Assistant. My work focused on administrative duties for the Improv for Anxiety, Improv and Autism, and Improv and Aging Programs. I was elated to be working in my field leading up to graduation before beginning a new challenge in marketing in a culture different than that of my home country. I am currently serving as a Marketing Consultant for DraftFCB as part of Columbia College Chicago’s Global Marketing Program in Prague. Our client is Hudebni Divadlo Karlin, which translates to Musical Theatre in Karlin. Already we have had the opportunity to attend performances of The Addams Family and Aida. I really appreciated that the theatre has subtitles in English that scroll throughout the performance above the stage. Although the music truly brought me into the experience of the actors, it was helpful to be able to read the text to keep up with the story. I felt lucky that I had already seen the original Broadway version of Aida, so I was able to pay more attention to the costumes and dancing throughout the show. It was a small difference to be able to read English subtitles above the stage as opposed to reading subtitles on a foreign movie at the bottom of the screen. This small contrast opens the door to sharing what other, larger cultural differences I have encountered in my travels thus far. The language barrier and differences in urban planning have required the most adaptation for me thus far. Growing up in the United States, it is so easy to assume that everyone values the English language as a necessity. In the Czech Republic, there are quite a lot of English speakers, many of whom also speak at least one or two other languages. It is refreshing to be in a culture where being multilingual is not an anomaly. It is clear that having such direct access to other European cultures allows for greater opportunities to learn other languages. I really appreciate this because I want to be a truly global citizen, and I aspire to learn as many languages as I can. Besides the language barrier, I find navigating the streets of Prague to be difficult for me. Living in Chicago, the grid of the city is extremely easy to follow. Not to mention it is in English thus easy for me to understand! Here, everything is written in the Czech language and the beautiful streets are arranged in curves and roundabouts that are not entirely clear to me. I get a little nervous to go exploring on my own. Although navigation is difficult for me, I find a similar safe feeling in Prague like the safety I feel at home in my neighborhood. I don’t fear walking to and from locations during the day at all. At night, I am usually with a friend or in a group, and I have felt safe for the entirety of my stay so far. It is such a relief to have safety be a similarity although it is much cleaner here than in Chicago. I have had the opportunity a few times to see the nightly street sweepers. What a beautiful city!